The villa offers that perfect beach holiday for families, or total relaxation for those wanting to get away from it all. 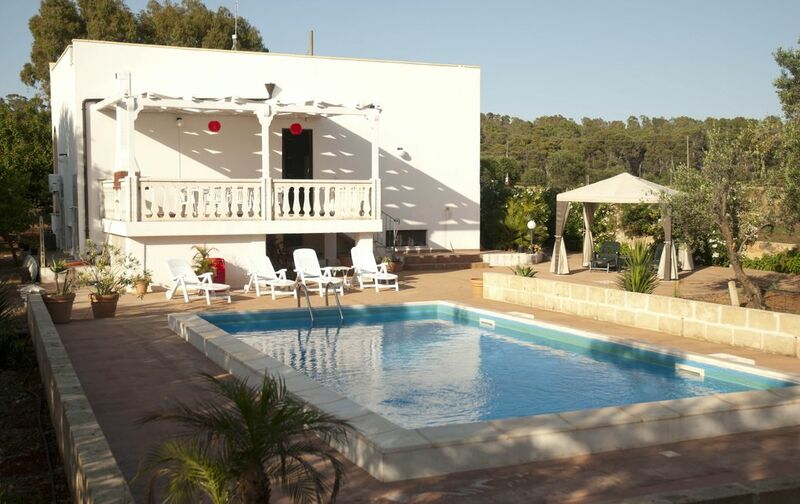 It is set in its own olive grove, has its own pool and is only a short walk from Torre Mozza beach and town. Torre Mozza makes up part of the beautiful Salenteno coast line known for its sandy beaches and clear sea. The region is also known for its trulli, many olive groves and local oil, as well as excellent cuisine and typical orecchiette pasta. The local towns are authenically Italian, don't expect to find pubs or clubs! instead lively piazzas with coffee bars, welcoming Trattorias and pizzerias. Inside comprises of a modern kitchen diner equipped with, washing machine, dish washer, fridge freezer, oven and microwave. The large living room complete with TV, DVD, and stereo, also has a sofa bed, allowing it to be used as an extra bedroom if necessary. There are three more double bedrooms, one with an en-suite shower room, and a further large bathroom. Comfortably sleeps 8. Outside, and to the front of the villa is a seating area on the veranda overlooking the fruit and vegetable garden. The many fruit trees include peaches, pears, oranges, lemons and figs. The vegetable garden is well stocked with seasonal produce, all available to pick. To the rear is a further seating area on a large balcony, this has a wood burning BBQ, and over looks the olive grove. We live and work in cheltenham. we have two teenage children. Mark is a footwear designer and I work in my childrens old primary school as a T.A. I am also a reflexologist. We had good knowledge, and fell in love with the area way back in the 90'S! Mark spent many years working with nearby footwear factories and we are fortunate to have friends there. Later on we took our small children on holiday and they loved the beaches and shallow sea, pizza and ice cream! The house was a must for us, we love the outside space, the olive grove, fruit trees and growing our own veg, not to mention the privacy. Its peaceful and tranquil a real escape. we love barbecues out the back, table football under the veranda. we love our well with its rusty old bucket! we love walking back through the olive trees as the sun goes down as we return from the beach. we love moonlit walks back from the pizzeria after watching the sunset over the sea. There are also two outside showers, perfect when returning from the beach. bath towels and bath mats provided. small section of hot drinks, sugar and U.H.T milk for arrival. mineral water. kettle, toaster, cafetiere, juice squeezer, bialetti espresso maker. Had a wonderful week- really enjoyed the pool and amenities in the villa were very convenient. Fabulous organic veg growing around the gardens which we could help ourselves to. Relieved that we had air con units in all bedrooms as it was very hot! Lots of mosquitos around so got lots of bites. Also, the villa is split into 2 levels, and weren’t expecting this- the steps going down were very steep and narrow so glad we didn’t have the folks with us this time or else they would’ve struggled with this. Also if you have young kids, this would be tricky unless you all sleep downstairs. It suited us ok as we had 2 older kids who didn’t mind being on their own downstairs at night. Owner was fabulous at sorting out any minor issues very promptly- this minimised any disruptions. Guy called Ivan handed us the keys etc and he was brilliant- such a nice man! Really pleased we picked this villa- thank you Mark and family! Torre San Giovanni has easy access to shops, bakery, fresh fish and vegetable stalls, the weekly market is stocked full of fresh local produce. There is a chemist and first aid. Boat and fishing trips can be arranged. In the evening the restaurants, trattorias and ice cream parlours are buzzing, there is an amusement park for children. Santa Maria De Leuca. The extreme tip of Italy’s heel. On the cape is the Church of Santa Maria de Finibus Terrae. From the lighthouse there are magnificent views extending, in clear weather to Albania. West of the cape is the little seaside of Leuca. There are boat trips along the coast with numerous caves. Gallipoli is a 'must see' separated from the new town by a bridge the old town boasts many churches and a maze of narrow streets. The fish market sells the days catch.You can find the best Pizza outside of Naples.